Today, I’m going to show you how to talk about (and how not to talk about) visiting people in English. 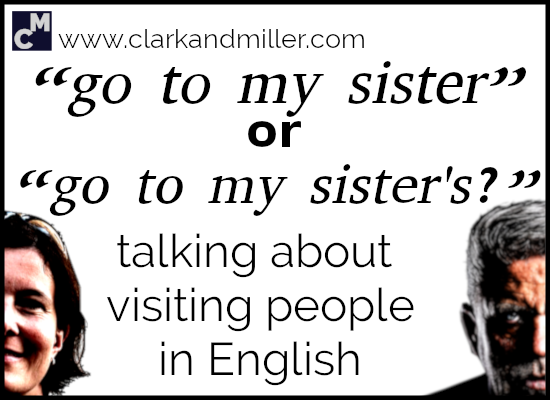 While you’re here, check out the 17 best Clark and Miller English lessons from 2017. Visiting people — such a simple concept, right? I mean — this is kind of elementary English stuff, right? “Yes” because you’ve been talking about visiting people since you started speaking English — since elementary. But also “no” for a couple of reasons. Firstly, advanced English learners get this wrong. A lot. This means that you might be getting it wrong, too. Secondly, there are also some neat shortcuts you can use to sound more natural when talking about visiting people (and people visiting you). So let’s clean up these mistakes, pick up some awesome new phrases, and then we can all eat cake. Or go bowling. Or whatever you like doing. OK. Let’s start with a classic mistake I hear very, very often when learners talk about visiting people. Here it is, coming from Yasemin. Now, this is technically correct, but it doesn’t mean what Yasemin thinks it means. She thinks she’s talking about visiting her sister. But she isn’t. OK. So what does it mean? This phrase isn’t about visiting a person. This phrase is about asking for help from someone. Anton is going to buy a house. He’s found the house and his bank has agreed to give him the mortgage. He’s excited. See how excited he is? Because Anton lives in one of those countries with a very confusing bureaucracy, he needs a signature from a police officer or a tennis teacher before the bank can give him the mortgage. But Anton doesn’t know a police officer or a tennis teacher. One day he’s talking to his friend, Simge about his problem. Fortunately, Simge’s brother is a tennis teacher. We go to someone when we want that person to solve our problem. It has no connection at all to visiting them. These people solve our problems! So how do I talk about visiting people in English? There are a few ways we can describe visiting someone. This solution is simple and clean, but it’s a little on the formal side, so it might make you sound a little robotic. We also tend to use this word when it’s a big deal, like going to another town (or country) to visit someone. But what about when we want to be less formal? How to talk about visiting people #2 — Use the wonderful apostrophe! So if “visit” is a little formal, how do we sound a bit more natural and relaxed? I’d say the most common way is by using the apostrophe. Well, there are two ways Yasemin can deal with this. Remember — and I want to make this point quite strongly because it’s a mistake I hear a lot– we don’t use “home” here. It sounds weird! Also, remember we would still say “house” in this sentence even if Alexa lives in a flat. Or a lighthouse. Or a cave. But there’s a trick we can use to make this quicker and even cleaner. How do I talk about people visiting me in English? You’re full of good questions today — nice one! OK. So let’s say it’s a different weekend and Yasemin is talking about her sister again. In this situation she was talking about visiting her sister, right? But what do you say when you want to talk about someone walking in your direction and then being next to you — physically approaching you. So now you can talk about visiting people and people visiting you, approaching people for help and physically approaching people. When was the last time you had more than 5 people round? What did you do? Let me know in the comments and we can share our stories and get the conversation going! Did you find this useful? Do you know any people (or ducks) that might also benefit from this? Then BE AWESOME AND SHARE! Spread the knowledge! Hi Clark. The last time we were more than 5 people round was just on Christmas when our daughter who lives in Germany came to our house to visit us. She went with her husband and two German friends. What did you eat? And perhaps, more importantly, who had to cook it? I wonder if using both ” … came to our house to visit us” is too much. Isn’t it enough to use one of them just to convey the meaning – “came to our house” or “visited us”? Hi Clark. We haven´t been five for Christmas since my dear sister, my nice and my aunt came from Santa Cruz, a Patagonian province to spend their summer holidays with us. It was a wonderful time!!! Great class, thank you so much. Hi Clark. It ´s been a long time since we were five for Christmas. It was five or six years ago. when all my family from Santa Cruz, a Patagonian province in Argentina, came to spend the summer holidays to Buenos Aires. It was a wonderful time, really fun for us. Thank you for this very clarifying class by the way. That sounds awesome. What did you eat? Honestly, I can´t remember but what I do remember is that there was a lot of food and that it was very hot. At last I’ve got it! At last!!! You are the best! Awesome! I’m so glad it helped you out. And what about ” to come to see somebody” ? Does it work if we talk about visiting people? That’s a good one. I’d say that we can use “come to see someone” as well. Thanks a lot for sharing this information. It’s really useful. I always use the verb “visit” and the apostrophe in such sentences. We had a party at Ben’s. or Kate spent her holidays at Granny’s. But using phrasal verbs makes our language vivid and more natural indeed. We had 11 friends round for my husband’s birthday. We talked and laughed, sang songs and ate a lot of food. And yes — I’d agree that phrasal verbs sound great! 11 people? Wow! That sounds both fun and, as a host, exhausting! Did you have to do all the cooking?